I was never a great breakfast eater. I would usually skip it all together and on days when I felt I needed to eat something I would get a bagel. Eventually I became so obsessed with eating an everything bagel with vegan butter and nooch that I was eating it a few times a week…or more if I’m honest. You can guess how great I felt after eating so many bagels a week. 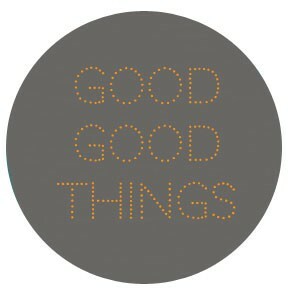 Not so great. I gave them up completely for a bit and had to find some new lighter and healthier breakfasts to eat. Its not to say I don’t eat bagels anymore. I just don’t eat multiple bagels a week. You gotta live and what would life be without the occasional bagel? On a quest to find new breakfasts I decided to try Chia Pudding. I tried store bought brands and wasn’t to impressed with them so I went about making the pudding myself. I tried a few different milk to chia seed ratio’s and finally found one I liked the best. I also like it best when I make it the night before and let it sit in the fridge for at least 10 hours. I like my chia seeds fully plump! After settling on a recipe I liked I couldn’t get enough of it. I add fresh fruit and chopped nuts just before serving to add extra texture and flavor. My favorite flavor combo is Mango Coconut and Almonds. It becomes a decadent breakfast that could also be a healthy dessert! 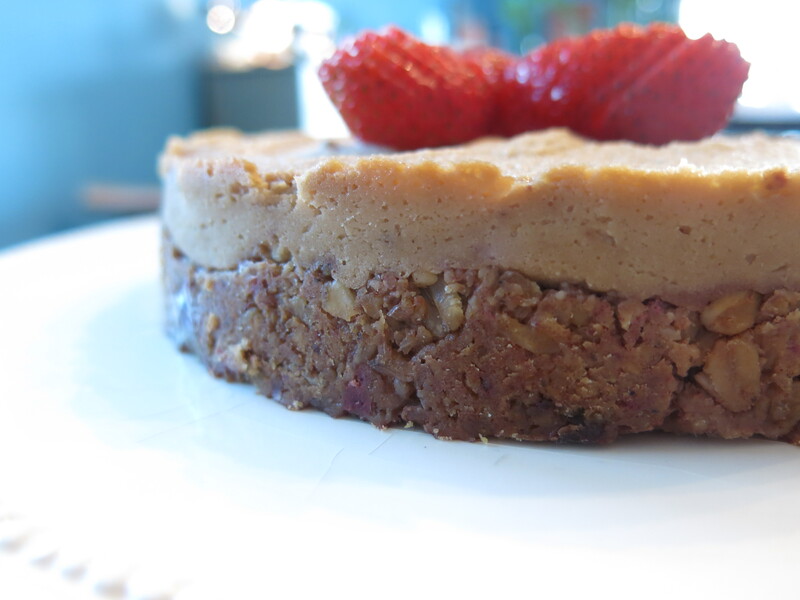 A decadent breakfast or healthy dessert. 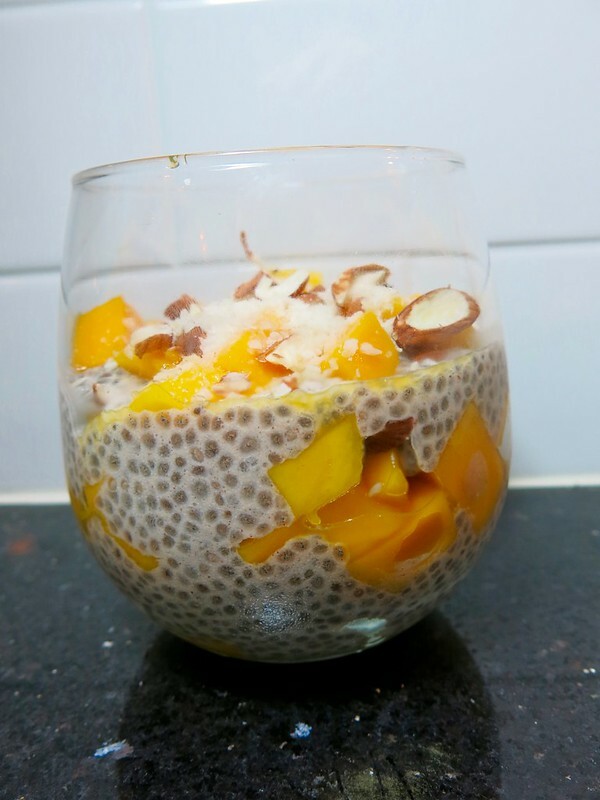 The basic Chia Pudding recipe is without sweetener. I find that the fruit adds enough sweetness for me. Feel free to add some agave or maple syrup to the recipe if you need to. Combine the ingredients, milk, chia seeds, cinnamon and vanilla, for the Basic Chia Pudding in a jar with a tight fitting lid and shake vigorously. Place in the fridge overnight, occasionally shake the jar when you think about it. The seeds will settle on the bottom and the occasional shaking will avoid it staying in a clump. To assemble. Layer the ingredients in a cup, bowl or jar. 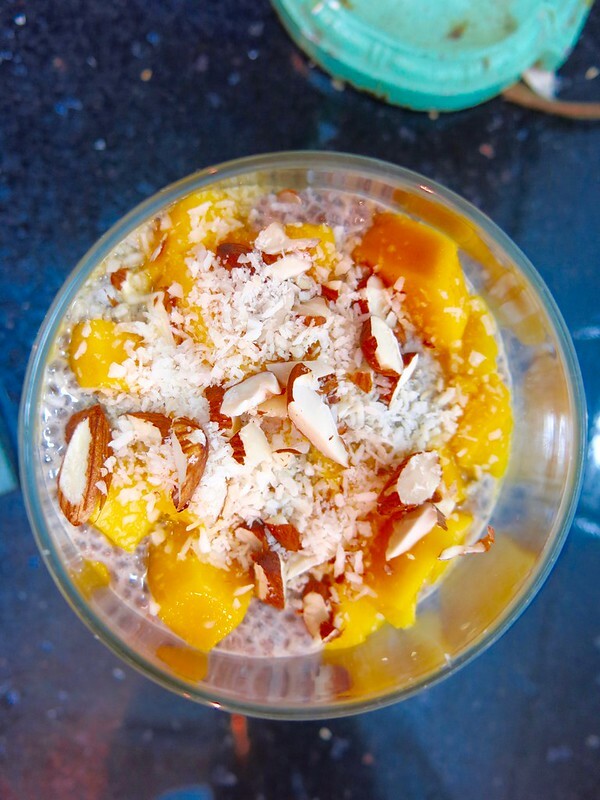 I like to add the mango, almonds, coconut and then the chia pudding and repeat 1-2 more times ending with the fruit and nut layers on top. Its been 6 months since my last post. Sorry about that! Even before that I was rarely posting. Kids and school, life and work got in the way. I’ve made so many changes in my life and how I eat I think I was too busy and overwhelmed to focus on my blog. Not that I have the month of August off I’m going to try to get things rolling again. I miss it. Regarding the change in how I eat…don’t worry…I’m still vegan. I’m just eating a whole lot healthier, since January, and you’ll see those changes reflected in the recipes I’ll be posting. I’m exercising a lot with a great trainer and group of people and I’ve lost quite a few pounds since the beginning of the year! I’m doing a lot of meal prepping which I hope to share with you guys. I’m feeling great. 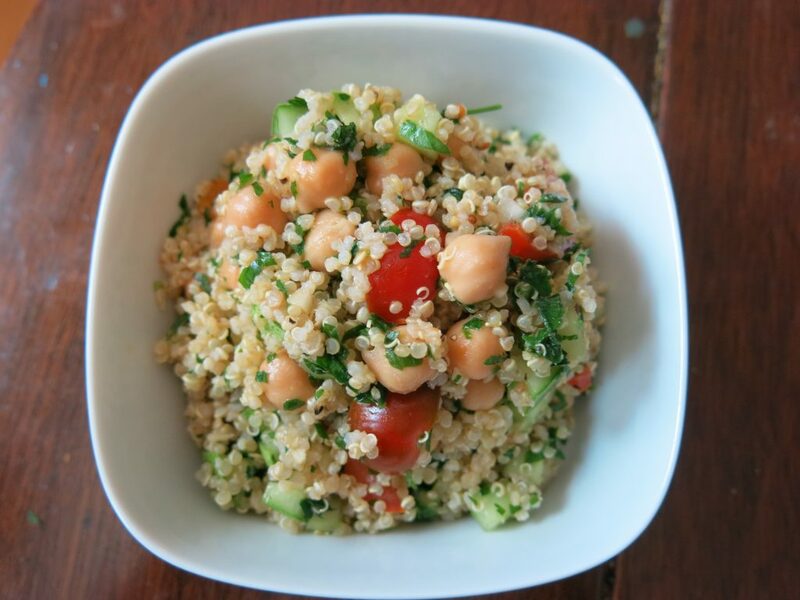 Today I’m sharing a simple recipe for Quinoa Tabbouleh w. Chickpeas. Every time I cook up a batch of quinoa I alway’s set some aside to make this recipe and then I end up using it for something else. I finally used up the extra quinoa for it’s intended purpose….this recipe. With already prepared quinoa waiting in the fridge all that’s left to do is chop up some veggies and herbs and mix everything together. Let it sit in the fridge for at least one hour to let all the flavors meld together. Its a really refreshing dish to make on a hot summers day and is perfect for the next vegan potluck you are going to. Eat it as a side dish or your main meal. That’s up to you. We ate it with a side of roasted zucchini and my husband enjoyed some stir-fried seitan with his. Each 1 cup serving has about 280 calories, 7 grams of fat and 11 grams of protein. 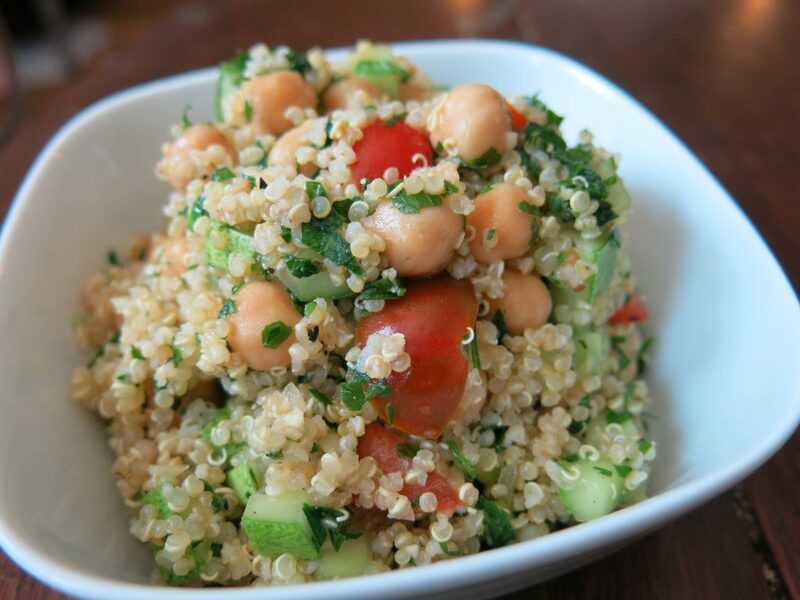 A delicious and refreshing quinoa salad with herbs and chickpeas. Make sure you use quinoa that is completely cooled. Feel free to adjust the seasoning to your taste. Place the cooked and cooled quinoa in a large bowl. Add all of the chopped veggies and herbs and mix. Pour in the lemon juice and olive oil and mix well to combine. Yields 5 cups of salad. A serving is 1 cup. 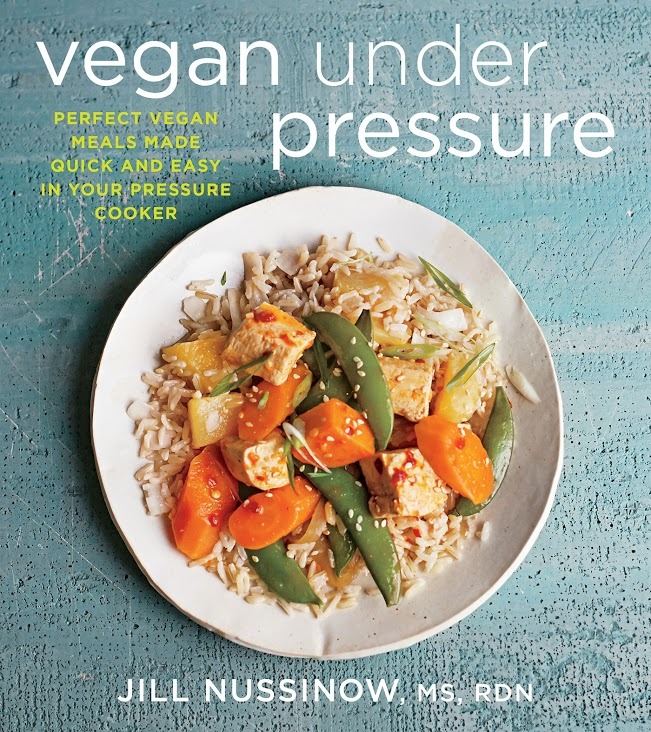 I am pumped to be part of Jill Nussinow’s book tour for her new cookbook: Vegan Under Pressure. About 6 months ago I purchased an Instant Pot, which, is an electric pressure cooker, slow cooker, rice cooker, yogurt maker and more (if you can believe it!) Its a miracle machine! Once you purchase your first pressure cooker, you join various pressure cooking facebook groups and you immediately become familiar with Jill Nussinow through those groups (if you didn’t know of her before then.) Her recipes are very popular and she is very active in the various groups with advice and tips. I love how she makes herself available to the community! She is a gem. Jill’s new book is a must for anyone who is new to pressure cooking (electric or stove top). It is filled with tips, tricks, charts, and cooking times for lots of beans and grains. I’ve already referred to it many times over the past few weeks while bulk cooking beans and grains for the week ahead and everything has come out perfectly. While choosing to highlight a dessert recipe is not unusual here on good good things I picked a dessert recipe because it’s one of the few things I’ve never done with a pressure cooker. 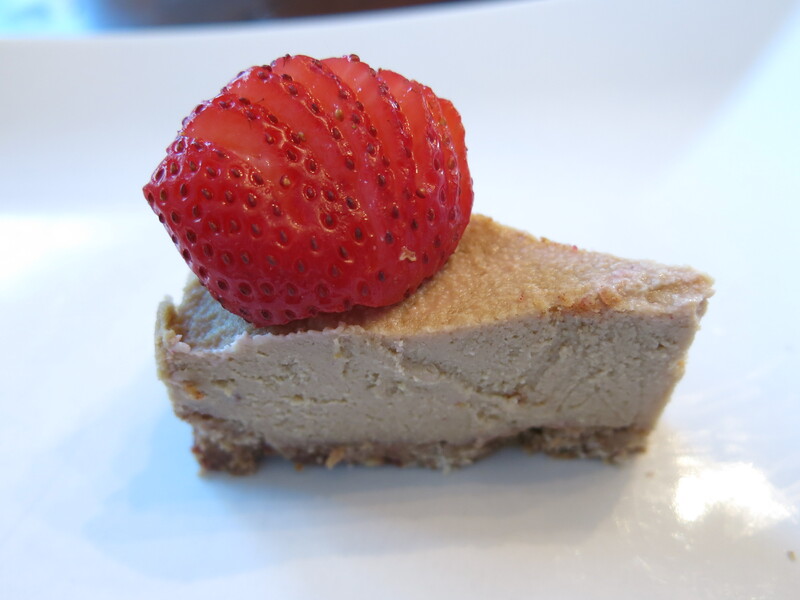 Beans, grains, soups, stews, and potatoes galore…yes…but dessert?…never. I was very intrigued and wanted to see if it would actually work! I’m happy to say that it did and I can’t wait to try more dessert recipes from Jill’s new book. I made the Straightforward Cashew Lemon Cheezecake over the weekend. This recipe had a few “firsts” for me: first dessert in a pressure cooker, first time using coconut flour, it smells amazing, and first time using coconut sugar. I was very pleased with how it came out and tasted. It’s a recipe I would be happy to bring to a potluck with me and probably will in the future. Jill has been kind enough to let me share the recipe with you. Let me know if you try it in your pressure cooker. 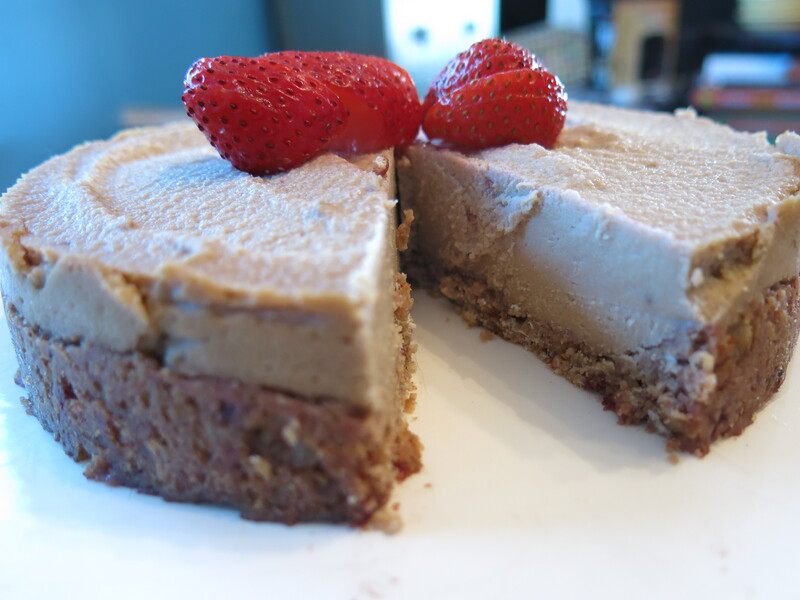 I am not a dairy cheesecake fan, but I love vegan cheezecake as it’s usually not cloyingly sweet or overly fatty. This comes together rather easily but seems like a very special dessert. It can be served with a variety of fruit toppings, depending upon what’s in season. The star is the filling, although the crust is mighty tasty, too. You do, however, need to remember to soak the cashews for at least 2 hours in advance. To get the best results, you need to use a high-speed blender. You can also make this in a regular blender or food processor, but know that you won’t get the creamy result that is intended (it will still taste darned good). You will need a 6-, 7-, or 8-inch springform pan that fits inside your pressure cooker. If you don’t want to make an oat crust, use your favorite raw crust. 1. Add 1½ cups water to your pressure cooker and add a rack elevated above the water. Create a set of helper handles to enable you to remove the pan. 2. To make the crust: Combine the crust ingredients in a mini food processor and process briefly until the mixture comes together. If it seems too dry, add a tablespoon at a time of the date soaking liquid until you have a cohesive “dough.” It should be firm but not gooey. Press into the bottom and a little way up the sides of a springform pan that will fit in your pressure cooker. 3. To make the filling: Drain the cashews, reserving the soaking water. Add the cashews and half the soaking water to a high-speed blender or food processor and process until smooth. Add more water, if necessary. Add the coconut flour, palm sugar, milk, lemon zest, lemon juice, and vanilla to the blender or processor. Blend well. Add the arrowroot and blend again. 4. Pour the filling into the crust, smoothing out the top. Cover the pan with foil or a cover. Lower the pan into the pressure cooker, using the helper handle, if necessary. 5. Lock on the lid. Bring to high pressure; cook for 20 minutes. Let the pressure come down naturally. Carefully open the cooker, tilting the lid away from you. 6. Using the helper handle, carefully take the pan out of the cooker. Remove the cover carefully so any accumulated moisture does not drip onto the cake. Set the pan on a rack to cool. Place the fruit on top of the cheezecake. Let cool for at least 30 minutes, then refrigerate for at least 1 hour before removing the outer part of the pan and serving. Houghton Mifflin Harcourt. All rights reserved. 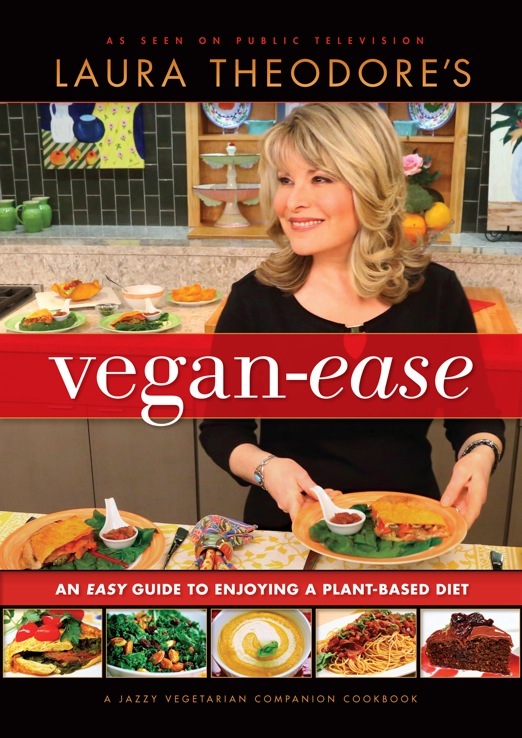 I am thrilled to be sharing a recipe and review today from Laura Theodore’s new book Vegan-Ease, An Easy Guide To Enjoying A Plant-Based Diet. 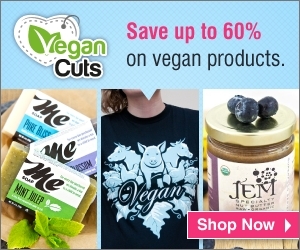 Laura hosts her own vegan cooking show on public television called The Jazzy Vegetarian and has a weekly radio show called Jazzy Vegetarian Radio. Can you guess that she is also a Jazz singer? Her new book is all about quick and easy recipes.There are over 130 recipes in this book with beautiful full color photos. Each recipe is marked with an Ease-Factor to make it easy to choose a recipe depending on how much or how little time you have to spend on cooking your meals that day. I’m looking forward to trying many of Laura’s new recipes. 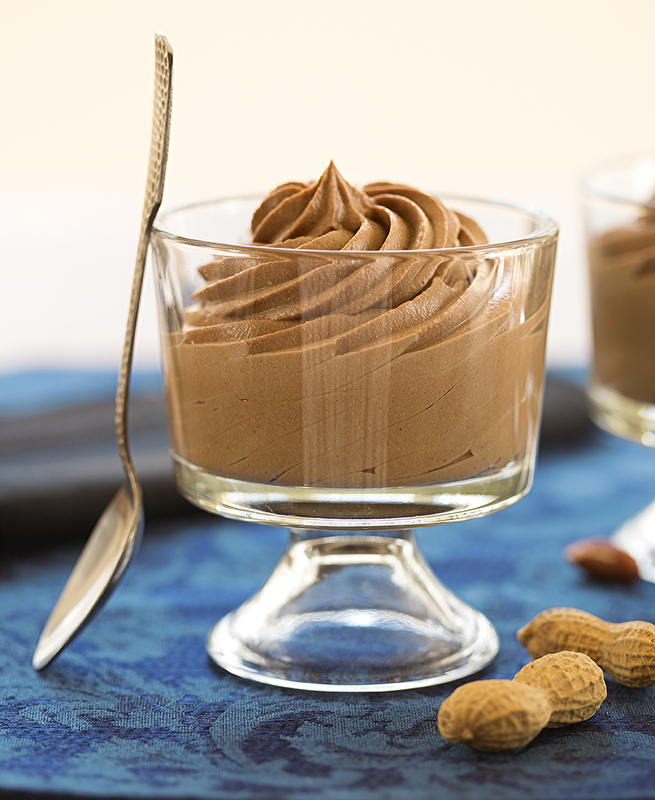 Today we are sharing Laura’s recipe for Peanut Butter Chocolate Mousse which has an Ease Factor of 1. It takes very little time to prepare this delightful dessert! Enjoy! Yum and double yum! 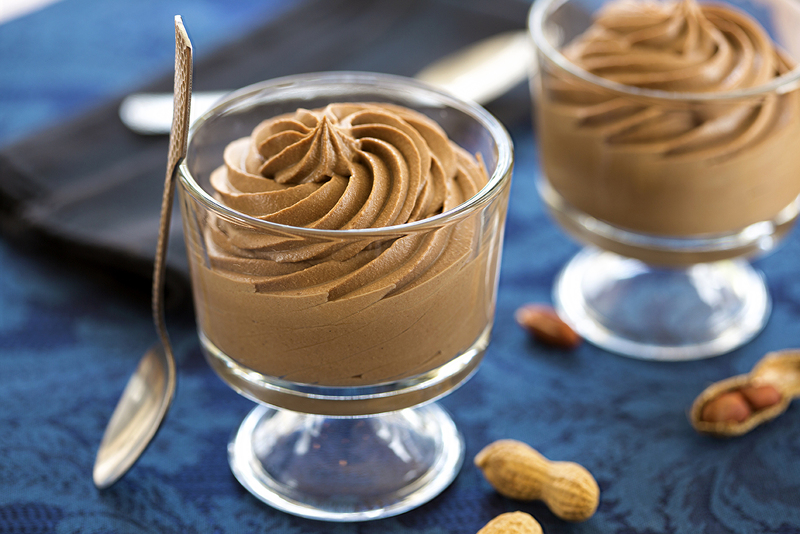 This super creamy and delightful mousse will please the chocolate and peanut butter fans at your table. Piped into small dishes, this is one special treat. Heat the nondairy milk in a small saucepan over medium-low heat until steaming hot but not boiling. Put the tofu, peanut butter and sugar in a blender container, then add the chocolate chips. Pour in the steaming hot nondairy milk and process until completely smooth. Spoon or pipe the mixture into dessert dishes and refrigerate 4-24 hours. Serve chilled. 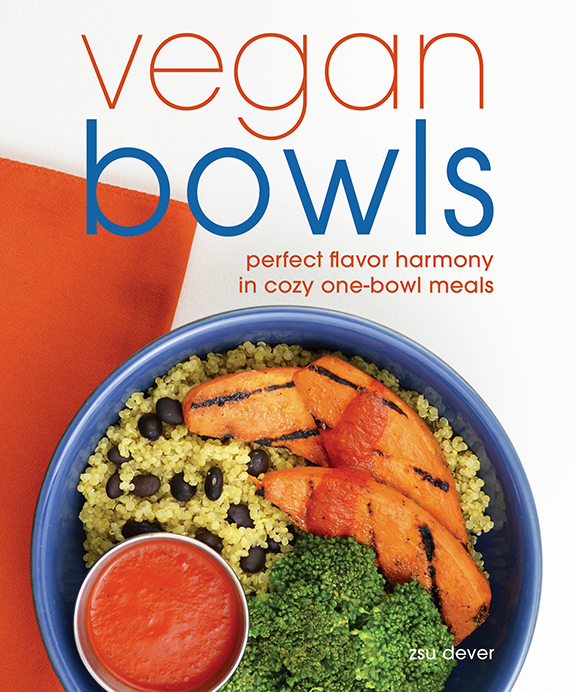 I am so pleased to be hosting Zsu Dever on her blog tour for her new book Vegan Bowls! I’m an absolute sucker for bowls. I’ve alway’s loved having everything tucked into a nice bowl, all mixed up, and ready to go. As I page through Zsu’s new book I am constantly adding recipe after recipe into my mental file of what I want to make. Paella Bowl? Yes. Seitan Gyro Bowl? Yes. Roman Style Tempeh Bowl with Kale and Apple Salad? YES!! Every time I turn the page and see a new recipe I want to make it! I love Zsu’s books for that reason. With her first book, Everyday Vegan Eats, and now with Vegan Bowls she creates recipes that are easy, delicious and will make you reach for her cookbooks when looking for something new to make. I am happy to be sharing her recipe for a lovely Thai Panang Curry Bowl. I hope you enjoy it. 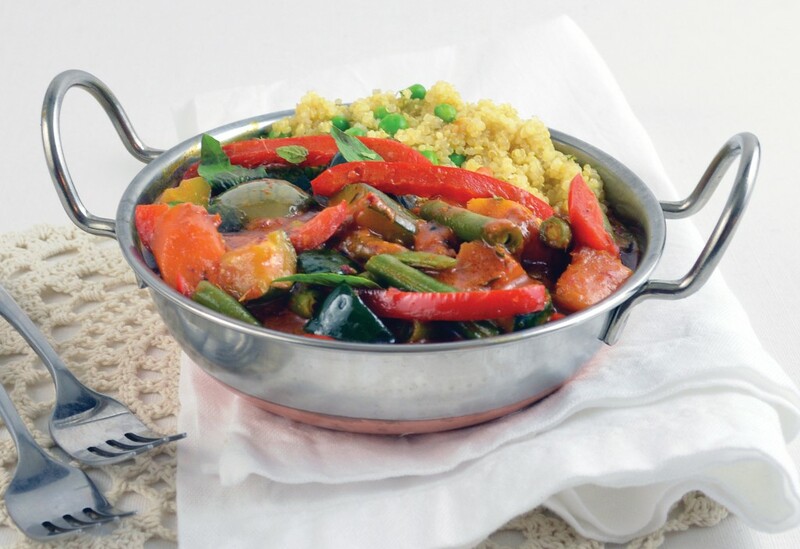 this curry is super flexible; use any variety of vegetables that you please. SOY-FREE OPTION: Substitute coconut aminos and 1/8 teaspoon sea salt for the tamari. from heat and set aside for 10 minutes. Fluff with fork and add peas before serving.